Flowing on from my previous question about writing my first component (now called com_picture) which is nearly an exact clone of the com_contact directory, I have hit a snag with trying to save a new "picture" with a tag. When I save a picture without a value in the tags field, everything is sweet. If I make changes to the Name, Alias, Category, Language, etc. -- all of those changes are preserved after I click save. It is ONLY the tags field that is failing. I have set my Global Configuration - Server - Error Reporting to: "Development" and read through all of the queries, but there are no INSERT queries (which I expected to see when adding a new tag) and the 2 UPDATE queries are not relating to the tag table. Basically, there are no clues in the 37 queries logged. If anyone, for some uncanny reasons, actually knows what I've done wrong please share. Otherwise, I'm merely asking how I can generate some informative error messages/clues as to what I've done wrong. As a bit more background, I've cloned the com_contact directory then done a case-sensitive replacement on all occurrences of contact, Contact, and CONTACT with picture, Picture, and PICTURE -- this was the simplest way forward for this prototype because it seamlessly handled singular/plural versions of the keyword for filenames, classes, functions, variables, etc. I also copied and adjusted all rows in all tables (I believe) which refer to com_contact so that com_picture is represented and all ids are pointing to the correct rows. Error Save failed with the following error: Another Picture from this category has the same alias (remember it may be a trashed item). 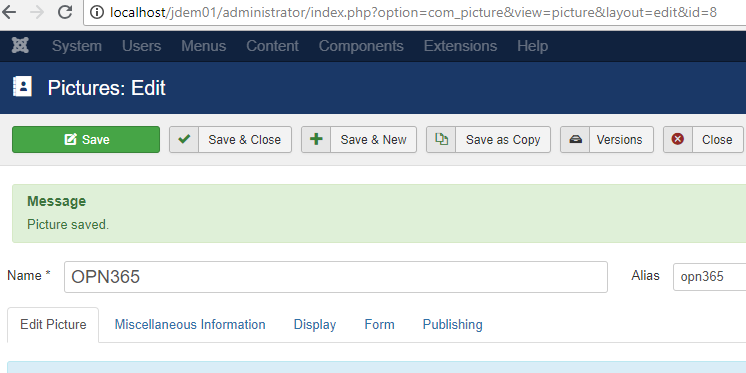 I am running Joomla 3.8.12 I am happy to implement any wild guesses so that I can move forward. I have already updated the #__content_types table by copying the Contact row and making contact -> picture replacements. To support tags in your component, you must add your content type to #__content_types table. Not the answer you're looking for? Browse other questions tagged custom-component tags error-reporting or ask your own question.